The diverse climates of Hawaii make this island so fascinating to visit. Within a short drive you can travel from a very arid area to a lush, tropical rainforest. In fact we describe one of our favorite scenic drives that travels through these amazing climate extremes. Kona average temperature data sourced from Weather.com. While the above temperature chart for Kona is very representative of the major beach resorts on the Big Island, venturing to higher elevations is a different story. For examples, if you go to Waimea, across Saddle Road, in the village of Volcano or in Volcanoes National Park, you’ll cross into higher elevations and cooler temperatures as a result. When you’re in these regions, you’ll probably want to have a light jacket or sweater with you. 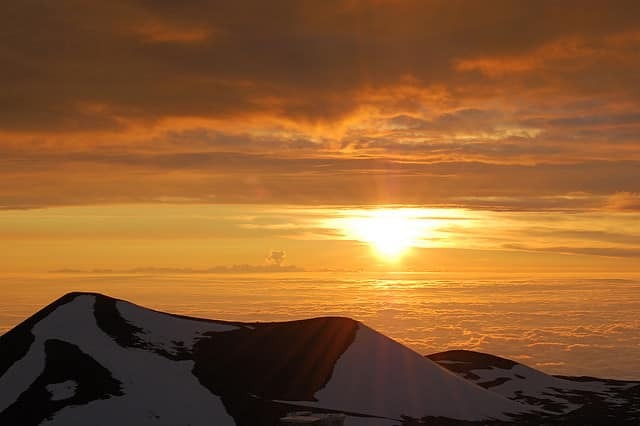 The summit of Mauna Kea stands tall at nearly 13,800 feet above sea level. At that elevation, the temperature is roughly 40°F cooler. If you take a Mauna Kea sunset and stargazing tour, most tour companies will provide parkas. As previously mentioned, Hawaii has many different climates. In addition to the temperature differences based on elevation, the various rainfall levels also create these amazing climate/environment differences. The following chart shows the rainfall levels as recorded on the Big Island’s two major airports — Kona (KOA) and Hilo (ITO). Notice the drastic difference. Kona’s dry conditions make it a great base for a sunny beach vacation, while Hilo’s plentiful precipitation make it a lush area to explore with beautiful waterfalls. The above rainfall chart also highlights the seasonal differences in rainfall — particularly for Kona. Note that the winter months from December through March are the wettest. As we’ve mentioned on the other weather guides, that doesn’t mean your days will be soaked with rain, especially since most rain falls overnight in Hawaii, but it does mean that conditions may be wetter than average. That being said, we’ve visited Hawaii island during the high-precipitation months of January and March and we enjoyed sunshine every day of the trip. Another point to note about the above rainfall chart is that the significant increase in rainfall between February and March is partially due to the fact that March has more days than February. When we further investigated it, rainfall levels in March were still slightly higher in March as compared to February, which is not as dramatic as the chart appears at first glance. Even though winter months tend to be a little wetter, we wouldn’t hesitate to book a Hawaii vacation in the winter. In fact, we tend to go to Hawaii quite often in the winter and it’s been very rare that we’ve encountered rain. We’ve never had a full day that was a complete rainout. Rain in Hawaii brings some benefits that we tourists enjoy. Rain makes the pretty waterfalls flow. (Note that some waterfalls dry up or are only a trickle after a dry summer.) The rain makes Hawaii’s delicious produce grow and the flowers bloom. If you have further concerns about rain, read our article — will it rain on my Hawaii vacation? As you review the rainfall trends, it’s also useful to look at the following maps. First the rainfall atlas shows the various microclimates of Hawaii Island — from very dry to abundant precipitation. The following satellite view of Hawaii Island also indicates the wet areas by dark green and the drier areas that appear tan/gray. If you want to increase your chances of having sunny days during your Hawaii Island vacation, first, we recommend the Kohala Coast with Kailua-Kona following in second position. As this site reports, the Kohala Coast gets around 11 inches of rain each year, while Kona gets just a bit more at 18.4 inches of rain. In August 2016 we plan to visit Hilo; in our many trips , we have never been there, because of its “rainy weather”. BUT what does that mean ? Is it raining every day ? Heavy rains ? Storms? and when they say LIGHT RAIN what does that mean ? Can we expect “short times of rain” and SUN afterwards ? or the sky is always cloudy ?? Hilo is not the sunniest city in Hawaii per this site. Additionally, Hilo is the wettest city on Hawaii Island. So, visitors would be wise to be prepared for rain. Patterns? Depends on the season. Usually more rain in the winter time but 2015 has been extraordinarily different, but for usual patterns, usually you can count on showers in the afternoon, particularly if you’re up a bit higher in elevation. From our many, but short visits to the Hilo area, we have noticed that when the weather was rainy, it was mostly rainy overnight. We can only recall one very rainy day in the Hilo area during an April visit in 2004. Other than that, we’ve enjoyed both sunny and partly cloudy days in the Hilo area. You can enjoy swimming, snorkeling, surfing, etc in the ocean year-round in Hawaii. According to the National Oceanic and Atmospheric Administration (NOAA), the ocean temperatures vary between the Hilo (average 73.8°F ) and Kona side (average 79.5°F). As we’ve already established, the Kona side of Hawaii Island is the more preferable beach destination and the water temperature adds one more reason. See our Hawaii ocean temperatures article for more information. We were not able to find a data source for Kona humidity levels. We would estimate somewhere in the upper 60s to lower 70-percent range. That may seem uncomfortably high, but when the tradewinds blow, which they do most of the time, that breeze keeps you comfortable. Besides relying on the tradewinds, you can do a couple of things to help you feel more comfortable in the humidity. First, we recommend you stay in an accommodation that has ample air conditioning. Last year, some of our friends stayed in a Maui condo that had one, under-sized air conditioning unit that wasn’t large enough to properly cool the entire condo. They were uncomfortable for several days. The other tip to combat humidity is to wear breathable, light clothing. Though Hawaii is currently experiencing a busy tropical storm season in 2015, that has thankfully skirted around the islands, hurricane season is normally a non-factor in Hawaii. Hurricane season runs from June through November with the months of August and September historically being the most active. Have you been to Hawaii (Big) Island? What time of year did you visit? How was the weather? We were in Hilo one February and it would rain for a block then be sunny for the next 2 blocks, then rain for three blocks then sunny for 1 block. All light rain and very enjoyable. It literally depends on which way the wind blows and it’s not seasonal or predictable in advance.